That’s a decent example of just a tiny fraction of what it means to be a Props Master. 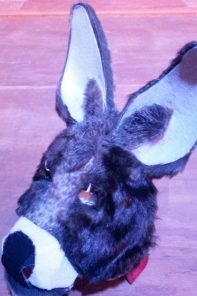 These words, spoken by local theatrician and Props Master, Vicky Moody, when we met at Jittery Joe’s in Watkinsville, give a slight glimpse into the triumphs and travails, the highs and lows, the almost-all-encompassing nature of what it means to be a Props Master. That’s an undeniably adorable romantic beginning for any couple, but for the Moodys it solidified the future of a stage and screen family. Vicky’s is a stage and screen family. With such a beginning, how could they not be? Wikipedia calls a prop anything — anything moveable or portable on a stage or a set. While that may be a workable definition by dictionary standards, it doesn’t begin to encompass what happens to the brain of a Props Master as she goes about her daily life. It’s all a delicate balancing act. Having plenty of storage space is a must for a Props Master. You will wind up recycling props, altering props just enough to have them fit the show, or smashing two old props and reconfiguring them to make something new. There’s a fine line between being a great Props Master and being a fantastic hoarder. The Moody children were destined for lives “trodding the boards”. Vicky’s son is an Art Director for TV and film. Her daughter acts. Her granddaughter acts. It’s just what you do when you’re a stage family. And they’ve taken Vicky’s lessons to heart. Her son worked on a show called “The Glades,” which takes place in the Everglades. For one scene the actors needed to dig a hole three feet into the ground. He told the director that it was going to be impossible to actually dig that hole. One foot down in the Everglades you hit water. That’s just the way the geography works there. So, Sean, Vicky’s son, had to construct a large fiberglass fake hole so that the cast and crew didn’t all sink into the alligator-ridden swamp. HOW DO YOU MAKE A FAKE COW AND A FAKE CHICKEN COME TO LIFE? “I was doing ‘Into the Woods’ at the Morton and there are some pivotal and complicated props in that one. There’s a toe that gets chopped off. There are all of the standard regal props, crowns, Cinderella shoes, and more. The cow, Milky White, is an important character in the show. A lot of the action revolves around the cow and he gets moved around a lot. He’s got to be durable. That was probably the largest prop I’ve ever made, and it took some work, but it wasn’t even the most difficult prop for that particular show. The script calls for a moveable chicken that lays a golden egg. I had to find a remote control robot of the right height and then construct a chicken around it. That I can do, but this chicken needs to lay a golden egg, but only at the right time in the play. The chicken gets picked up, moved around, and played with in mid-air onstage, all before it lays its golden egg. So the egg has to be nestled in the chicken’s, uh, rear, and stay there for a long time, while the remote controlled chicken/robot gets its time in the spotlight, but the egg also needs to be able to be removed on cue. It was a difficult balancing act for a Props Master. Since Vicky was telling me about how, after having been a Props Master for so long that she can’t help but look at pretty much everything she sees through this lens, I thought it would be fun to make a game out of it. We were in a Jittery Joe’s, and this location, even more than most of their other ones, tries to set itself up as a kind of community living room that sells four dollar coffees. Therefore, there’s a lot of random, interesting stuff all around. Assuming Joe’s would let us just steal anything in the store, I asked Vicky to look around the place and tell me what she would take as a potential future prop (after they let us out of jail for pilfering all of Jiterry Joe’s cool stuff). I had to cut her off before her enthusiasm got me excited and we went on a coffee shop ransacking spree, but it was a quick insight into how the mind of a Props Master works. Vicky is always thinking about what might make a great prop or be part of the raw material to make a great prop somewhere down the road. The prop table is a sacred place. Like a religious artifact or a baby, there are strict rules governing who can touch the prop table, when, why and how.